A renaissance man by the very definition, Patrick Lose has spent his entire professional career being creative in one medium or another. An accomplished actor, singer, artist, illustrator, award-winning costume designer, author, fabric designer, pattern designer and outside-of-the-box quilter, Patrick is always looking for new ways to inspire and bring color to the world around him. 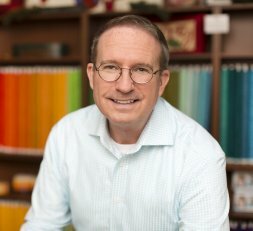 "When I sit down to doodle at the drawing board, I never know what one of my designs might become.” Whether it's unique fabric prints, quilts, clothing, stationery products, or home decor, he enjoys creating it all. Patrick is well-known for his playful novelty designs and colorful trendsetting basics, which he's created over the 23 years he’s spent designing cotton fabric collections for the industry's leading companies and, now, for his new company, Patrick Lose Fabrics. As an author of dozens of quilting and crafting publications, Patrick generously shares so many of his creative endeavors. Revered by quilters for his unique method of mixing traditional piecing with contemporary applique techniques, he focuses on creating a variety that attracts quilters of all ages and styles. His quilts, crafts, clothing, and home decorating accessories have graced the pages of such distinguished magazines as his own Celebrations in Quilting, Better Homes & Gardens, American Patchwork and Quilting, Country Crafts, Christmas Ideas, Halloween Tricks & Treats, Love of Quilting and many more. Always proud to be a longtime friend of independent retailers, Patrick’s fabric collections, books and patterns can be found at your greatest source for inspiration - your local independent quilt shop.